Is Keith 'Chicken & Waffles' Olbermann a 'Passive-Aggressive' Racist? Home > Is Keith 'Chicken & Waffles' Olbermann a 'Passive-Aggressive' Racist? Keith Olbermann this week has been happier than Ralphie Parker on Christmas morning over a left-wing group-generated controversy over Bill O'Reilly. But like the BB-gun-receiving protagonist of "A Christmas Story," lil' Keithie needs to know the dangers of (metaphorically) putting his eye out. After all, on September 9 on NBC's "Football Night in America," Olbermann made a cryptic crack that could be taken to be racially insensitive, if not racist. SEE Video (0:54): Real (1.46 MB) and Windows (1.64 MB), plus MP3 audio (417 kB). On Tuesday's "Countdown," Olbermann awarded O'Reilly both the "worser" and "worst" person in the world awards to his higher-rated competition at the Fox News Channel. O'Reilly, Olbermann thundered, is a 59-year old "passive-aggressive racist" for his recent remarks about his visit to a soul food restaurant. With the Denver drive having stalled, Roscoe Parrish on the punt return. Roscoe's Chicken and Waffles at its finest. He could go the entire distance and does and it's seven-zip Bills. Now, I'm not saying Olbermann is a "passive-aggressive racist," but a man who makes jokes about a soul food restaurant being the reason for a black athlete's success on the football field should be a bit more circumspect, especially since O'Reilly colleague and black journalist Juan Williams has defended O'Reilly, saying his remarks were grossly taken out of context. Update 14:00 | Matthew Sheffield. The situations are so eerily similar it's almost enough to believe in karma. 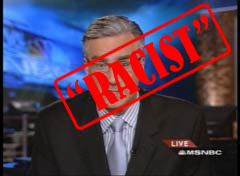 There's no possible scenario that O'Reilly can be considered a racist without Olbermann being considered one as well. Keith Olbermann is a man living in a glass house. He really ought not to throw stones. Reporters who are going ga-ga over O'Reilly's "racism" need to start looking into Olbermann's.